Winter’s over. Time to take the chopper out of the garage, leather up, and hit the highway. 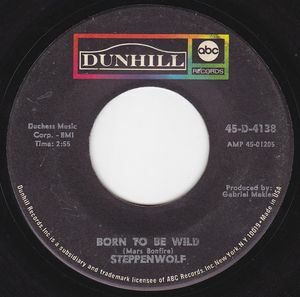 And there’s no better song to get your motor runnin’ than Steppenwolf’s ode to two-wheeled glory, “Born To Be Wild,” arguably one of the first rock anthems and the subject of many music geek debates about the first heavy metal song. “Born To Be Wild” certainly rocked harder than anything else at the time with its distorted, attacking guitar riffage and furiously pounding drums. And, of course, it’s the first song to actually use the phrase “heavy metal” (although not in reference to the music). But that’s not how the song was originally envisioned. 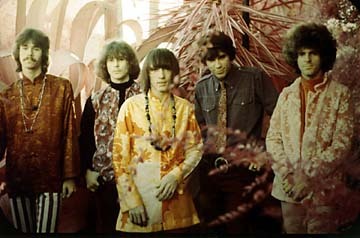 Dennis Edmonton made the long trek from Canada to Los Angeles with his brother Jerry and the rest of the folk-rock group, The Sparrows, in the mid-60s. Finding little success in the overcrowded music scene, the band folded, only to resurrect themselves as Steppenwolf soon after, sporting a powerful new sound and a couple of new faces. Dennis had the left the group and was working on his songwriting under the nom de hippie, Mars Bonfire, but remained close with the band. While strolling around the environs of downtown L.A. one day, Edmonton looked into a shop window and saw a poster that bore the legend “Born To Ride” above a picture of a motorcycle rising up out of the earth. Having recently purchased his first car, Edmonton took that feeling of freedom and applied it to a motorcycle ride. He went home and wrote “Born To Be Wild” as a folky acoustic ballad. And it might have stayed that way, but luckily, when he played the song for his former bandmates in Steppenwolf, they heard the electric possibilities. Steppenwolf took the bare bones of “Born To Be Wild” and added layers of muscle, transforming the song into a hard-charging rock anthem. Released in the summer of 1968, the single just missed the top spot on the charts, but gained a new level of fame and significance the following year with its appearance in the counterculture classic, Easy Rider. It’s been overplayed and clichéd over the ensuing decades, but it still kicks like a herd of mules. So hop on your hog and take the world in a love embrace. Turn up the volume, and explode into space.